In order to protect your warranty rights, and to be informed of product enhancements and upgrades, please complete this registration form immediately. Proper registration serves as proof of purchase in the case that your original receipt is lost. Additional information is requested in order that we may understand our customers’ needs and provide products to meet those needs. Which factors influenced your decision to purchase this product? What is your application for this product? What new products will you consider purchasing within the next 12 months? What special features do you want? 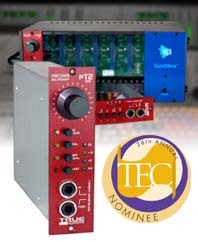 Introducing the PT2-500 mic preamp and instrument direct-in. Our new Type-2 design gives this ultra-resolution preamp all the detail of our other models, with serious analog depth and warmth.